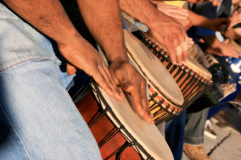 Drumming workshops are offered for beginning and intermediate drummers. Advanced drummers may be interested in joining the Joy of Djembe Drumming performance ensemble. The Workshop was designed to provide the drummer with the essentials to be a confident contributor in drumcircles. And provided the proper tools and foundation to continue growing in drumming proficiency whether under the tutelage of an instructor or self taught through books or DVD’s. Ultimately developing the skill set to play in an Ensemble or Drum Troupe. • You can pay with PayPal, credit card, cash, or check. Checks must be received 7 days prior to the workshop. • Bring your Djembe, Ashiko, Conga or Bougarabou. 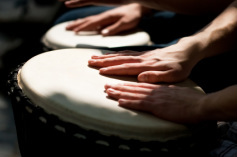 • If you need to rent a djembe, there is a $25 drum rental fee. • Drum rental requests must be received at least 7 days prior to the workshop. • There will be a one hour lunch break. Please pack your lunch. There are few eating establishments in the area. • Wear loose comfortable clothing. Bring drinking water, a notebook and a pen; a small audio recording device is optional. Student must be able to clearly play SLAP, TONE, and BASS; and feel and clap the pulse of the rhythm. The goal of this workshop is to make the student a more fluid and well-rounded drummer, fully capable of performing in an ensemble or dance & drum troupe. Student must be competent in the items covered in the Intermediate Workshop curriculum. The goal of the workshop is to make the student capable of leading a drum circle and to continue down the path of deepening one's knowledge and understanding of hand drumming.